Fall colors, Wrangell - St. Elias National Park, Alaska. 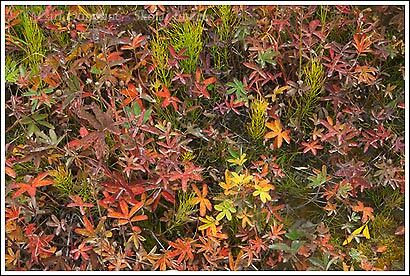 Fall colors, Wrangell – St. Elias National Park, Alaska. Here’s another photo from the recent trip – some nice all colors right by camp. What’s wild is 10 yards from where I took this scene we were shooting the ripples in the sand dunes in a desolate, dry terrain. This Alaska landscape sho do get crazy. I’m going to be out for a while, so will upload some scheduled posts, and reply to comments, etc, as I’m able. I’ll try to drop in every so often and let you know what I’m up to – right now, I don’t really have any idea of what that will involve, other than trying to stay warm, and out of the rain. This entry was posted in Abstract Photos, Alaska, Fall, Landscapes, Wrangell - St. Elias National Park on September 21, 2008 by Carl D.
That’s awesome. Looks like a wild box of crayolas!! Thanks – I never thought of ‘crayolas’, very cool. I hadn’t see it like that before.